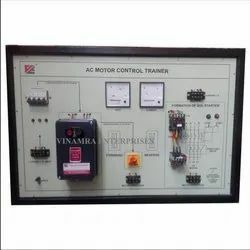 We are a leading Manufacturer of 3-phase dual converter trainer kit, vsi inverter trainer, csi inverter trainer kit, half controlled symmetrical & asymmetrical bridge converter and ac motor control drive trainer from Jaipur, India. Trainer kit for studying different three-phase AC voltage controller circuit configurations. This kit provides platform for rigorous experimentation on three-phase AC voltage controller. 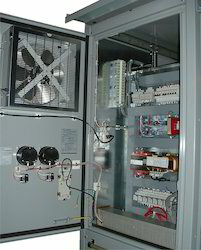 All possible configurations of three-phase AC voltage controlled should be experimented. The kit works directly supply and all measuring meters connected externally. Proper isolation between control and power circuit should be provided. Test points for observing intermediate waveforms of gate pulse generation should be provided for observation. Loads are provided for experiment (R Load and R-L Load). Study of gate pulses respect to SCR and other control circuits and their signals. 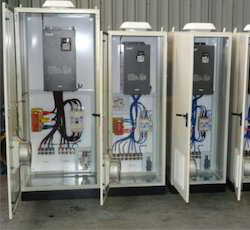 Three- phase AC voltage controller with inside delta controlled loads. 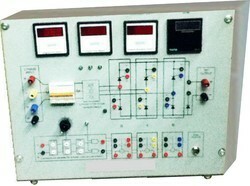 Three-phase, four-wire line controlled AC voltage controller with star loads. 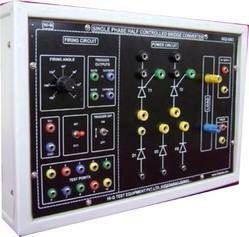 Power Electronic Training Board has been designed specifically to study and obtain the waveforms for single phase half controlled symmetrical & asymmetrical bridge converter. This protects external instruments for damage if they are not isolated. Triple, 3 input AND gate IC. Quad, two input AND gate IC. Potentiometer for referance voltage adjustment.